This post originally appeared on Minxeats.com on December 18, 2012. I like to visit New York a couple of times a year, mostly to sniff perfume, but also to eat. I hadn't been up there since January, so it seemed like a good idea to visit the big city during the Christmas season. My train was getting in to Penn Station just before 11am, the time when Shake Shack opens, and I felt that would be a good way to start my day. 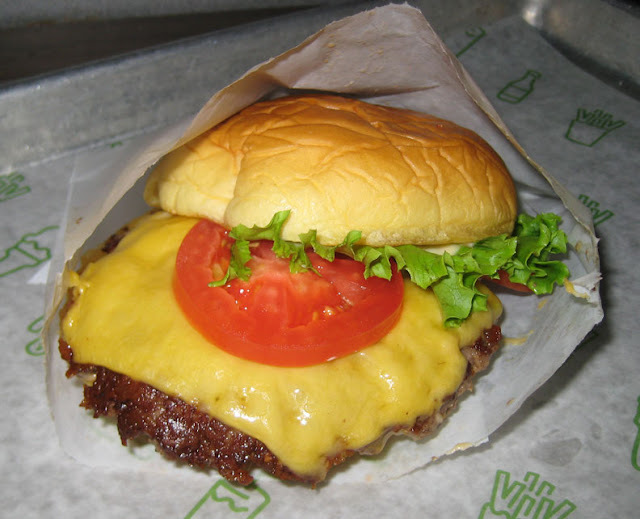 Shake Shack has been generating long lines and tons of good buzz since it opened in Madison Square Park in 2004. There are now six locations in New York, two each in DC, Connecticut, and Florida, one in Philly, and two in the Middle East (with London coming soon). The world is apparently obsessed with burgers. I love them myself and wanted to know what all the fuss was about. As with the Five Guys' hoopla, I find it's mostly much ado about nothing. The Shack Burger is a fine, tasty burger. The edges are slightly crisp, the cheese is melty, and the bun is properly squishy. It's a good fast-food-style burger. Nothing orgasmic, earth-shaking, or life-changing. I'd eat it again if it were in front of me, but I wouldn't necessarily go out of my way to do so. Later in the day, I hoofed it from 5th and 58th to the Time Warner Center at 8th and 59th. Why is it that a three block walk across town feels like 10 blocks? Up several escalators, I found A Voce. (You may remember that the restaurant's executive chef, Missy Robbins, cut her finger so badly in the first episode of Top Chef Masters season 4, she had to leave the competition.) I had tried to make a reservation the day before, but was told by Open Table that no reservations were available for that evening. I decided to walk in and take a chance. If they had nothing for me, I'd head up another floor and try Chopped judge Marc Murphy's Landmarc. But the hostess was able to seat me at a two-top facing the bar, where I was attended to by a handsome and charming young waiter. The service was really quite fantastic at A Voce - attentive, yet casual. At one point, my waiter wanted to know how I was doing with my appetizer, but he couldn't get close enough to my table to speak to me, as a water boy was in the way. He merely raised a questioning eyebrow and gave me a thumb's up. I nodded in affirmation, he smiled and walked away. I didn't even have to stop chewing. The meal started off very well. 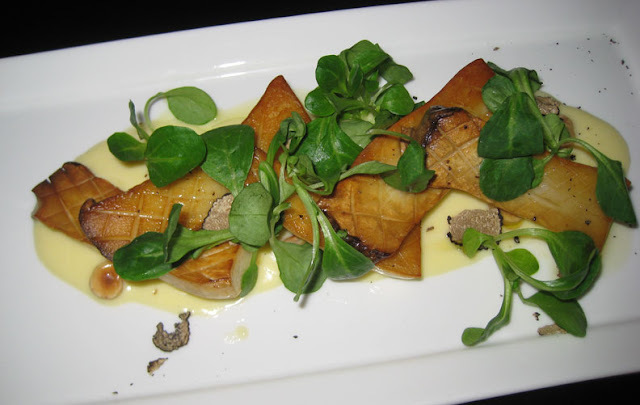 There were a number of appetizers I wanted to try, but I settled on the funghi al forno. The roasted mushrooms were almost meaty in texture, and indeed required a steak knife to slice into manageable pieces. The fonduta - a truffled cheese sauce - was incredibly rich, yet not overly so. Once the mushrooms were gone, I found myself reaching for a piece of focaccia to sop up the remaining sauce. The hazelnuts added a toasty nutty crunch to round out the dish. Really lovely overall. Speaking of lovely, that focaccia came with a dish of whipped ricotta with fresh basil, drizzled with olive oil. Good thing there wasn't a spoon with it, otherwise I might have embarrassed myself by eating it straight from the container. While the first course was successful, the pici that I ordered for my entree was a total disappointment. Pici is a hand-rolled pasta, somewhat like a thick spaghetti. Imagine making a snake of modeling clay by rolling it between your palm and a table top, and you've got pici. Because they're somewhat thick and about 4" long, picking them up with a fork is like wrestling with a bowl of tarantulas. They're not easily twirled, so a fork full had random ends hanging out in each direction, some of which were happy to slap me in the face as I brought the fork to my mouth. Eventually, I used my knife to cut them into shorter bits. In any case, awkwardness was the least of the dish's problems. The sauce was a bolognese in name only. It had an agrodolce (sweet and sour) thing going on that could have been quite delicious had the sauce had any other thing going on, too. 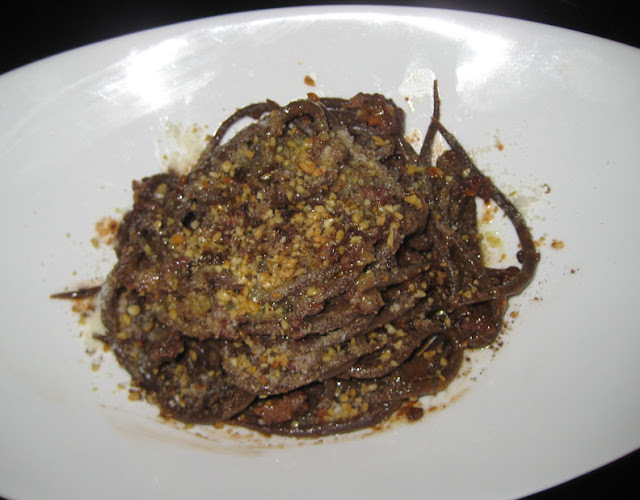 The tiny nubbins of ground duck (which could have been any meat - turkey, rattlesnake) served as a textural element only, and I couldn't taste the cocoa in the pasta. After three or four bites, I was bored with the dish. Thankfully, it wasn't a large portion, so I pushed on and finished it, knowing that a doggie bag wouldn't safely survive the three-plus hours it would take me to get home. On the side, I had a generously-portioned bowl of beets. I suppose it was sized for the table, but I love beets so a mess of them is fine with me. They were served chilled and topped with finely chopped pistachios. Some of the beets tasted citrussy, others tasted slightly pickled - there was definitely more flavor in the side dish than in my entree. Since I had a glass of wine with dinner, I passed on dessert. It was just as well, as I was presented with a mignardise of two very soft, house-made, limoncello marshmallows. One bite was enough sweetness for me. I love New York. I love dining in New York. Sure, I'm disappointed sometimes, but I am always happy to have the opportunity to try popular restaurants and formulate my own opinions about them.